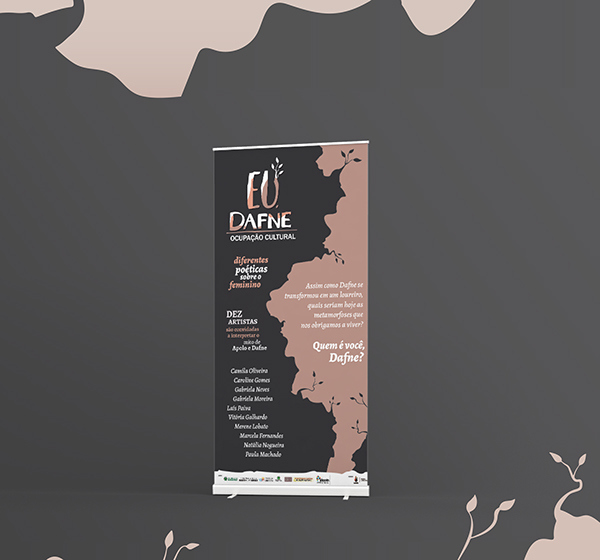 IDENTIDADE VISUAL DESENVOLVIDA PARA O PROJETO EU, DAFNE. 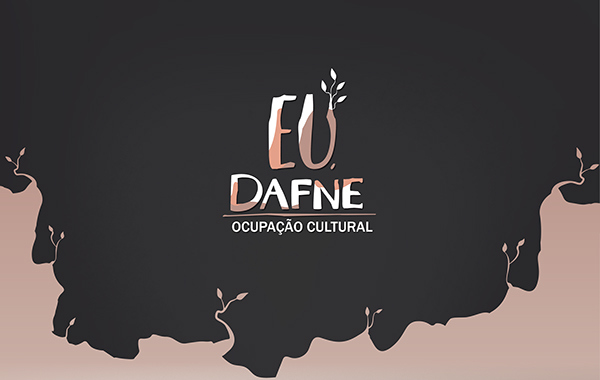 Eu, Dafne foi uma ocupação cultural que aconteceu na Pinacoteca Municipal de Bauru no começo de 2018 e teve como objetivo explorar as temáticas acerca do mito grego da ninfa Dafne e do deus Apolo. Essa exposição contou com o trabalho de 10 artistas que, com suas obras promoveram a reflexão sobre o feminino, relacionamentos, formas equivocadas de amor (e de amar), sobre quem são as Dafnes de hoje. As arte foram desenvolvida pensando na proposta de todo o projeto, levando em consideração as estéticas do feminino por meio da na justaposição de um mito antigo com os dias de hoje. 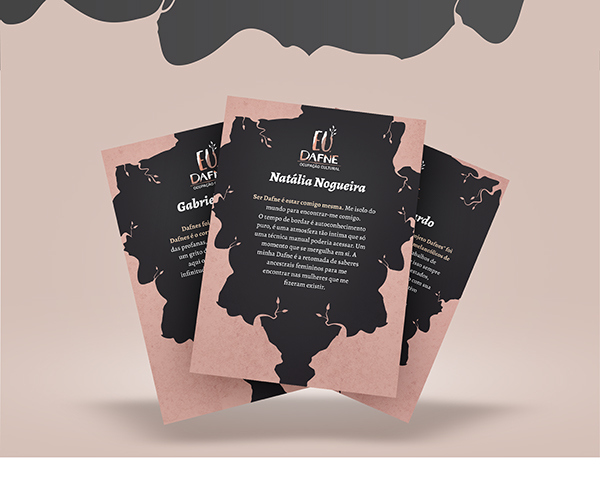 Foram desenvolvidos o logo, cartaz, banner, painel e cartazes informativos sobre a obra de cada artista. 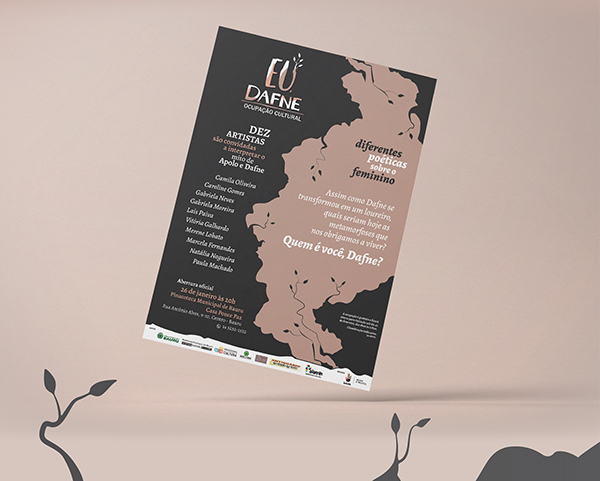 Visual identity developed for the "Me, Dafne" project. 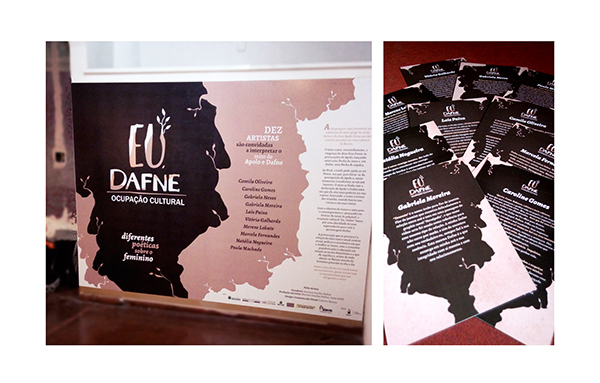 "Me, Dafne" was a cultural occupation that happened in the Municipal Pinacoteca of Bauru in the beginning of 2018 and had as objective to explore the Greek myth of the nymph Dafne and the god Apollo. This exhibition was formed by the work of 10 artists who, with their works, promoted reflection on the feminine, relationships, mistaken forms of love, about who are the Dafnes of today. The art was developed considering the proposal of the whole project, taking into consideration the aesthetics of the feminine through the juxtaposition of an ancient myth with the present day. We developed the logo, poster, banner, panel and informative posters about the work of each artist.